BRYAN EATON/Staff photo. 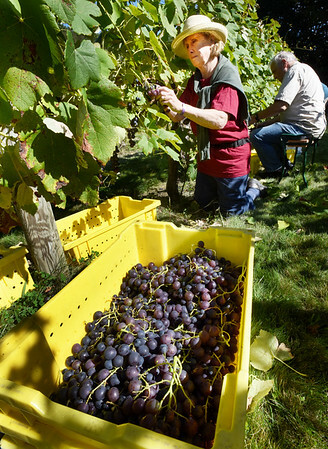 Jewell Towne Vineyard owners Brenda, pictured, and Peter Oldak along with a couple friends, continued to pick their grapes Monday and Tuesday after a small army of friends and employees harvested the bulk of the crop over the weekend. The South Hampton winery, which is over the Amesbury town line, opened in 1994 after they started planting a vineyard in 1982. This year they won a "double gold" award for their 2016 vintage of their Vignoles at the fair The Big E, which also bestowed on them Best New Hampshire Wine.